The teaching materials for the learning experience on “The Atonement of Jesus Christ” are divided into three parts. Part 3 contains a practice exercise that will help students apply the doctrine they learned from the Doctrinal Mastery Core Document and the doctrinal mastery passages related to their study of the Atonement of Jesus Christ. 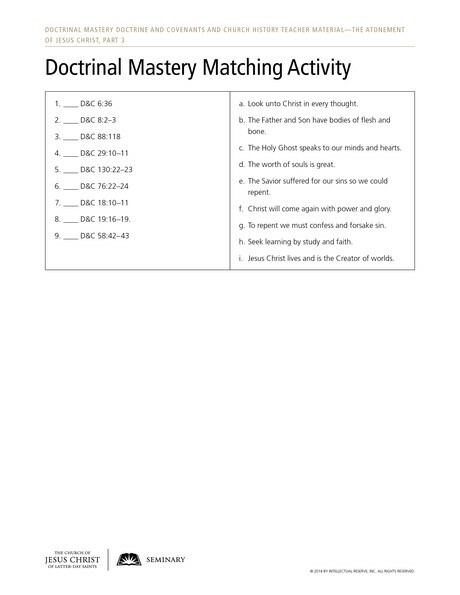 This lesson also includes a cumulative review of all the doctrinal mastery passages students have studied so far. Note: You could teach the practice exercise and the doctrinal mastery review in this lesson in a single class session or in two separate class sessions. Please make sure to share class time with your regular sequential scripture lesson from the Doctrine and Covenants. Sofia has decided that she would like to serve a full-time mission. She has committed some serious sins, and she knows she should confess them to her bishop. However, she decides not to confess her sins because she is afraid of what her bishop may think of her. She tells herself that if she goes on a mission and works extra hard, the Lord will forgive her even if she does not confess her sins. Do you think Sofia is acting in faith? Why or why not? How might she behave differently if she acted in faith? How do her choices and behavior demonstrate that she is not examining her situation with an eternal perspective? How might considering her choices in the context of the plan of salvation or the teachings of the Savior help her to see her situation with an eternal perspective? Invite students to turn to one of the doctrinal mastery passages in the Doctrine and Covenants about the Atonement of Jesus Christ that might help Sofia understand why she should act in faith or examine her choices with an eternal perspective (Doctrine and Covenants 18:10–11; 19:16–19; 58:42–43). Give students time to review these passages. What did you find in the doctrinal mastery passage you chose that could help Sofia? Invite a student to read aloud the following statement by Sister Linda S. Reeves, who served as a counselor in the Relief Society General Presidency. Invite the class to listen for the difference between the two missionaries that Sister Reeves described. “When I served with my husband as he presided over a mission, we went to the airport to pick up a large group of missionaries one morning. One particular young man caught our eye. He seemed sad, weighed down, almost distraught. We watched him carefully that afternoon. By evening, this young man made a belated confession, and his leaders determined that he needed to return home. Although we were very sad that he had been dishonest and had not repented before coming on his mission, on the way to the airport we sincerely and lovingly praised him for having the courage to come forward, and we pledged to stay in close contact with him. “This great young man was blessed to have wonderful parents, great priesthood leaders, and a supportive, loving ward. After a year of working hard to fully repent and partake of the Savior’s Atonement, he was able to return to our mission. It is difficult for me to describe the feelings of joy we felt as we picked up this young man from the airport. He was full of the Spirit, happy, confident before the Lord, and anxious to fulfill a faithful mission. He became an outstanding missionary, and later my husband and I had the privilege of attending his temple sealing. “By contrast, I’m aware of another missionary who, knowing her unconfessed sin from before her mission would surely cause her to be sent home early, made her own plan to work extra hard during her mission and confess to the mission president just days before completing her mission. She lacked godly sorrow and tried to circumvent the plan that our loving Savior has offered each one of us” (Linda S. Reeves, “The Great Plan of Redemption,” Ensign or Liahona, Nov. 2016, 89). What differences can you see between these two missionaries who needed to repent? How would each of them have been better off if they had confessed their sins before being called to serve as missionaries? Why do you think it is important for us to confess and forsake our sins? Ask students if they can think of any additional scriptures or general conference addresses that might help Sofia. Testify that as we see our sins and mistakes with an eternal perspective and repent of them in the way the Lord has taught us, we will be forgiven and feel the peace and joy that come from knowing that the Lord is pleased with us. Encourage students to consider their own lives, and if they have committed sins for which they have not yet repented, encourage them to do what is required in order to repent fully. Provide each student with a copy of the accompanying handout. Invite them to use the handout to match the scripture references of the doctrinal mastery passages to their corresponding key phrases. Do not allow students to use their scriptures or the Doctrinal Mastery Reference Guide while they complete the handout. Look unto Christ in every thought. The Father and Son have bodies of flesh and bone. The Holy Ghost speaks to our minds and hearts. The worth of souls is great. The Savior suffered for our sins so we could repent. Christ will come again with power and glory. Seek learning by study and faith. Jesus Christ lives and is the Creator of worlds. After they have had sufficient time to complete the handout, go over the correct responses as a class. Then give students time to review any of the doctrinal mastery passages that they missed on the handout. You might invite students to work together in pairs, each helping the other to review the passages they need to know better. If time permits, you may want to give students another copy of the handout and let them fill it out again, or repeat the quiz verbally with the class. The Great Plan of Redemption (11:10)—Sister Linda S. Reeves, who served as Second Counselor in the Relief Society General Presidency, speaks of a missionary who truly repented and felt the Lord's forgiveness. You might show this video from timecodes 3:40 to 5:41 instead of having a student read the account of Sister Reeves.